© 2019 Ubisoft Entertainment. All Rights Reserved. Far Cry, Ubisoft, and the Ubisoft logo are trademarks of Ubisoft Entertainment in the US and/or other countries. 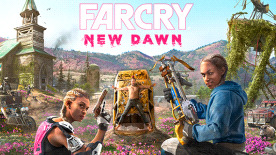 Based on Crytek's original Far Cry directed by Cevat Yerli. Powered by Crytek's technology "CryEngine." Please Note: For customers from Russia, China and Commonwealth of Independent States, only Russian and Chinese language content will be available.